Welcome to our March 2011 design newsletter! 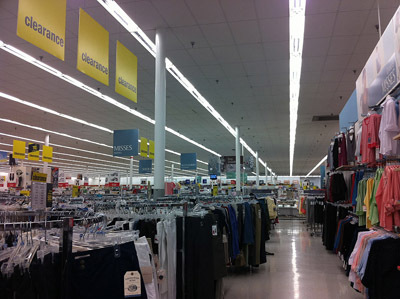 How many of you go to the Sears and Target stores in Mission Valley, San Diego? Do you feel any difference between them? The two stores are practically identical and sell almost the same products, but Target is doing so much better! Did you ever think why? I wrote this small article to show you a few differences and to make you think about your own business and how you could stand out from your competitors! Don’t forget to post your reply to this newsletter on our Blog. In our Green News corner, I would like to give you some useful information about different radiation types and levels. The Fukushima explosion in Japan made all of us really worried here in California, and knowing exactly what is going on with our air is very important. You can also check out a live radiation monitor in Santa Monica, CA HERE. What Does Target Have that Sears Doesn't? It has become my habit, which derived from my profession, to look and to analyze businesses’ ambience, environment and branding techniques of every space I walk into. Walking into a neighboring Sears I kept asking myself, what is Sears missing and what does Target, which is located very close, have? 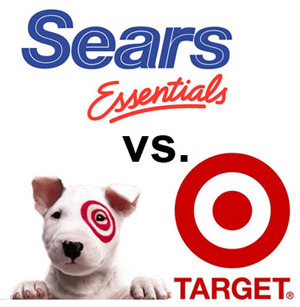 What makes Target a success when Sears is suffering tremendously? Being an entrepreneur and an architectural designer I would like to discuss some design aspects that I personally think could be improved to lift up Sears’ image. If you missed it, read our last news letter on How Happiness has become a new Trend in Commercial Interiors of large companies. There is nothing more important in any business’ design than the design of good and professionally done signage! Signage at the local Sears has very subdued undefined colors and shape. It is scattered randomly around the store in different colors and doesn't help us to find what we need. The truth is, it is not professional-looking and lacks any hint of creativity. Signage at the local Sears has very subdued undefined colors and shape. In opposition to the Sears store, Target has created very sharp, well-defined signage. We can immediately appreciate that Target researched their market, knows their own branding colors and is very aggressively using it. Target’s signage is creative and fun to look at! Sears reminds us of a huge warehouse with no definition, pale colors and small, almost invisible images sprinkled around the store to get us excited about their products. But is it enough? Does it grab our attention and make us want to try on their clothes? I cannot say yes. 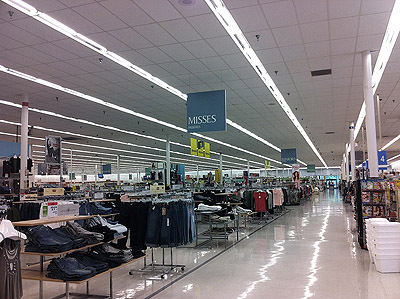 Sears' interior colors are very bland and do not give any emotions to the customers. The images are very small and hang too high for us to even notice. Target on the other hand is full of action! It is a well known fact that the color RED provokes excitement and suggests love. Images of happy people having fun additionally reinforce this message! Yes, I do want to be happy, I do want to look like that, I do want to shop here! 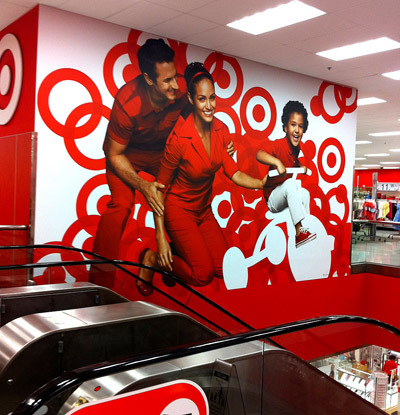 These are all the subliminal messages we are getting while looking at the Target store's interior. I also would like to point out the creative use of Target’s logo throughout the store. It’s everywhere! It’s even a part of their walls patterns. 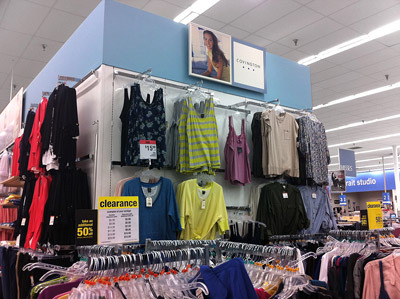 Sears has been practicing a very bad labeling system for years; people have to ask sales personnel about any discounts. How many times have you had an incident that the Sears product you thought was on sale is actually not when you got to the register? Sales signage at Sears is very small, almost unnoticeable, sometimes simply hard to figure out. When something is on sale at Target, you will know right away! 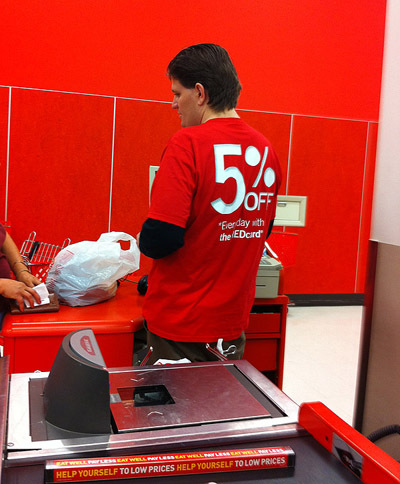 Not only does Target have huge signs hanging throughout the store, and not only are self-serving scanners placed on every corner of each department, but the staff actually wear the sales ads on the backs of their bright red t-shirts! Now, that’s marketing! What do we see as we enter the Sears store? What is the Sears store all about? How do people move through Sears? What do they see first, what second, etc? What do they buy on the way out? I think I will leave all these questions for Sears to figure out. In the end I would like to give you my design idea for Mission Valley Sears. 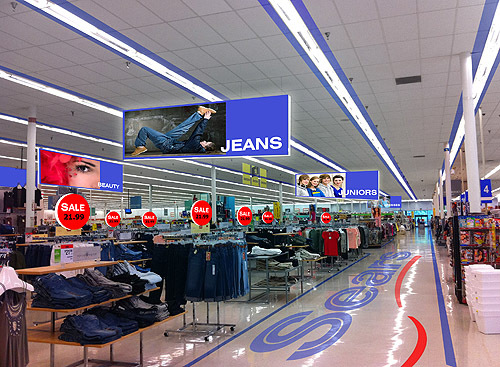 This is a simple Photoshop rendering I did to to show how a shopper's experience could be improved by simply adding some aspects of branding and design to this Sears store. Please let me know what you think! I've used Sears' branding color for the signage and some accents on the floor. The ceiling could easily be painted to add that extra creative touch. 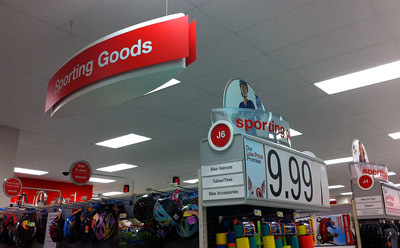 I would illuminate the larger signs and make the sales signs to stand out more, again by using Sears' bright red color from the logo. "The Fukushima explosion is the worst nuclear disaster in Japan since World War II. This situation comes on the heels of—not one, but two—natural disasters, and in the midst of this crisis, questions undoubtedly arise about the safety of radiation exposure." Read more and l earn about different types of radiation HERE.